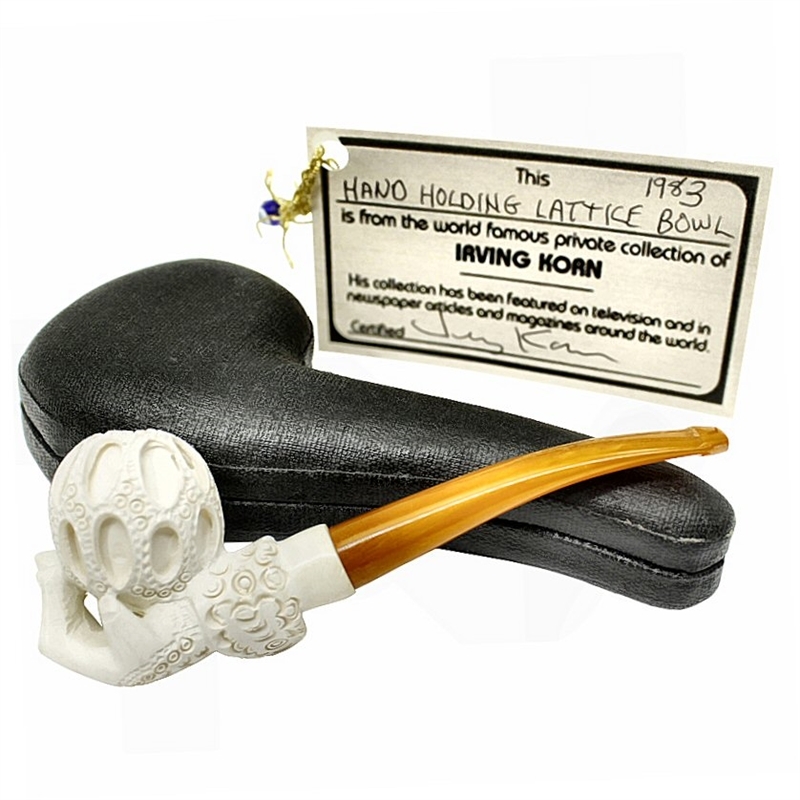 Hand Carved Hand Holding Lattice Bowl Meerschaum Cigarette Holder - Three dimensional carved oval lattice cigarette holder bowl is held by a ladies hand with a delicately carved cuff. 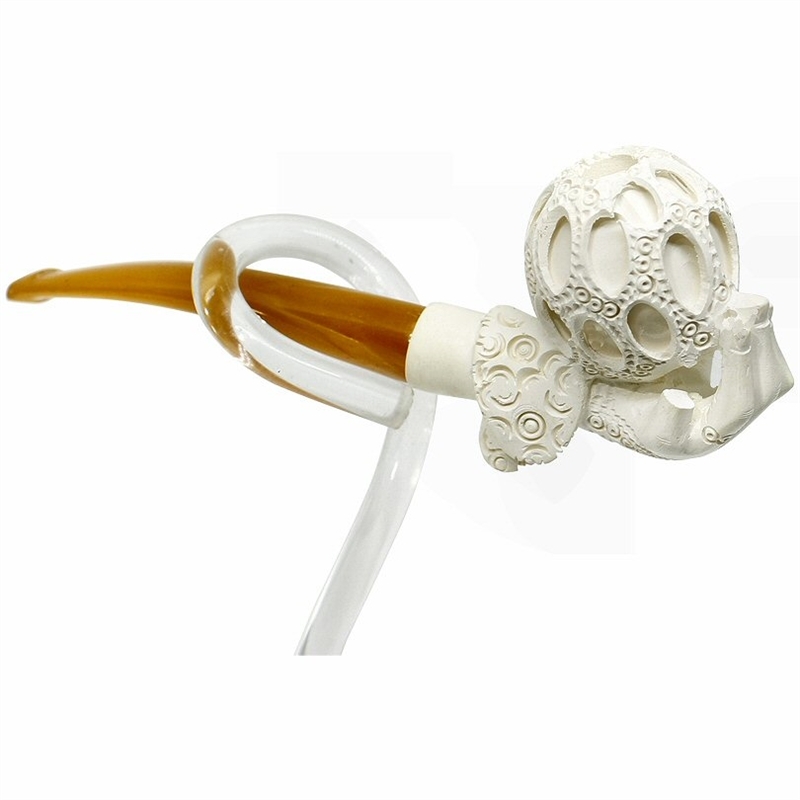 Made from top quality block meerschaum the holder will turn a darker color as you smoke thru it, the same way a solid block meerschaum pipe changes color. This beautiful carving is greatly reduced in price because sadly over the years a small piece of the little finger broke off along with a minor break on one piece of lattice. Both are only noticeable on one side. It is such a special piece rather than disposing of it we are offering it at a very discounted price. This unique cigarette holder comes certified dated 1983 from the estate of Irving Korn. It is hand carved from 100% Solid Block Meerschaum and was imported from Turkey by Mr. Korn to add to his private collection recognizing the delicate carved details for a meerschaum cigarette holder. After carving it was soaked in beeswax so that after being smoked it will color over time. The amber colored stem is made of a special Amberoid Acrylic for good looks and long lasting durability. The holder has not been smoked and comes in a custom made fitted black leather hinged case with a textured velvet lining. It holds any regular or 100mm size cigarette.